Our Family Emergency Preparedness Plan will guide you through developing your own Emergency Preparedness Plan with actionable steps and forms to complete. 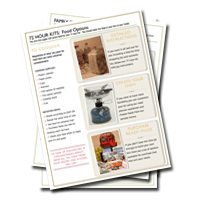 The components of a basic Emergency Preparedness Plan: Family Plan, Disasters Kit, and Evacuation Lists and bonus info on computer backup and other basic info. It is crucial for you to have a back-up way of heating and cooling your home in case of emergencies occurring during extreme weather conditions. While this isn’t always fun to talk about, it’s important to plan for and be ready for in case there were a situation where regular sanitation methods became unavailable.